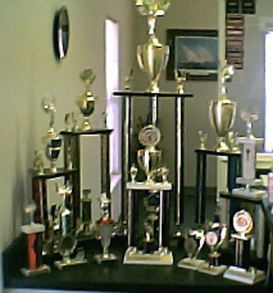 Awards of the Fernandina Pirates Club | Fernandina Pirates Club, Inc.
Members of the Fernandina Pirates Club are good, no, make that “great” at winning awards. 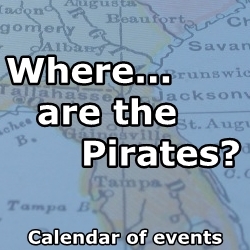 They have traveled from South Florida to West Virginia, pirate ship in tow, to spread tales of their tiny NE Florida Island. With two road-worthy, pirate ship floats: Amelia’s Revenge and the Miss Amelia Pearl, club members wave flags, carry banners, hand out beads and pirate hats, dance in the street and fire black powdered weapons from their floats all in an effort to entertain the crowds, but especially to promote the Isle of Eight Flags Shrimp Festival, the City of Fernandina Beach and Nassau County, Florida. 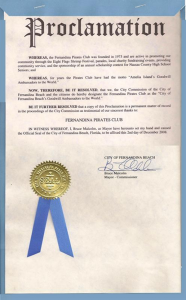 IN WITNESS WEREOF, I, Bruce Malcolm, as Mayor have hereunto set my hand and caused the Official Seal of the City of Fernanidna Beach, Florida, to be affixed this 2nd day of December 2008. 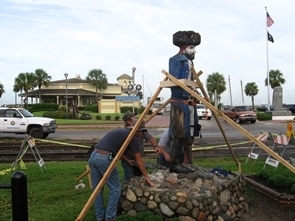 Rehabilitating Pete: A deteriorating landmark in historic Fernandina Beach, one who stood proudly as a symbol of community fellowship at the old Welcome Center at the waterfront, was recently hijacked by the Fernandina Pirates Club who coordinated the restoration and unveiling of the wooden sculpture of a pirate. 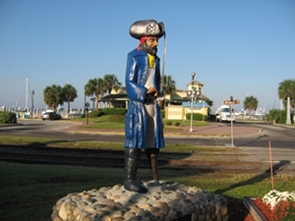 A community-wide contest to name the statue was won by the students of Emma Love Hardee and Peg Leg first took his place on October 14, 1978. Originally carved from a single ten foot piece of live oak by artist Wayne Ervin, it took the cooperative spirit of an additional two dozen volunteers and contributors to bring the historic landmark to life. Pete, as Peg Leg became fondly known, is reported to be the single most photographed icon in Fernandina Beach. 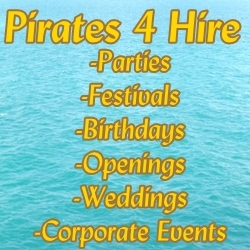 When Eric Childers was the president of the Fernandina Pirates Club, he approached his crew about the project to restore their comrade and was met with an overwhelming commitment to accept the responsibility to patch up the acclaimed pirate. 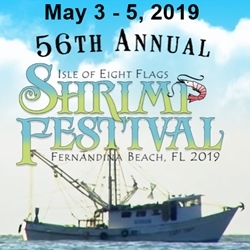 Since 1973, the pirates have been responsive to the tangible needs of our community such as promoting the Isle of Eight Flags Shrimp Festival, local charity events and are the sole sponsor of a scholarship contest provided each year to Nassau County High School Seniors. 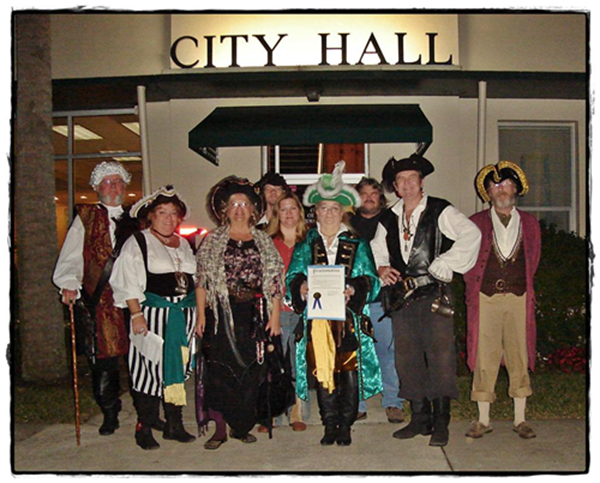 Though mostly thought of as fun-seekers who only hand out beads at local parades, these Pirates do a whole lot more! But, when the club took a closer look at Peg Leg, they realized he had lost over half of his original weight and in fact, he was in worse shape than anyone had imagined. “This is going to take more than a face-lift and a paint job,” members teased. His fragile core was hollow in many places from insect damage, his rotting wood was crumbling apart and a bird had even built a nest in his weathered head. 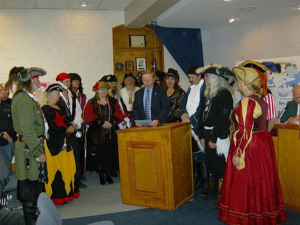 With the welding skills of Container Corporation and the professionals with the City’s Street Division, Peg Leg was transported into the care of the Pirate Club’s membership to undergo several weeks of intense rehabilitation and therapy. 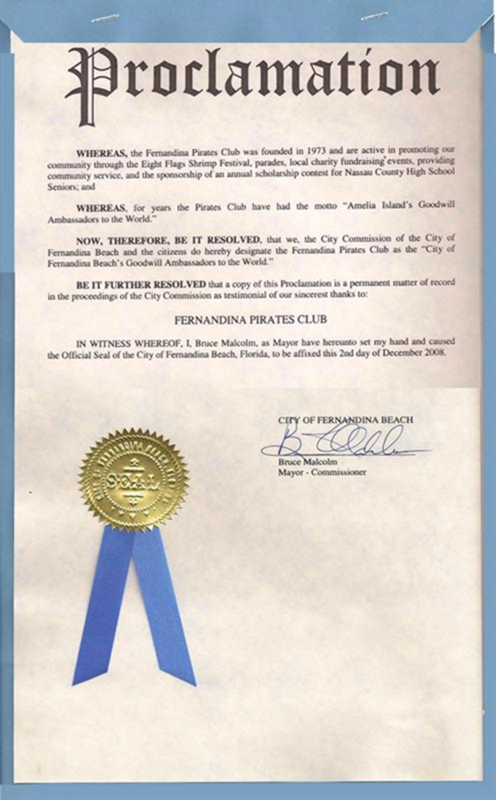 On November 10, 2007, the Fernandina Pirates Club proudly unveiled Peg Leg Pete, refurbished and restored. The Sign Shoppe provided a new dedication plaque and Rafloski Photography documented the exciting event.